Urologists and urological surgeons are found easily with our accurate, human-verified email database. 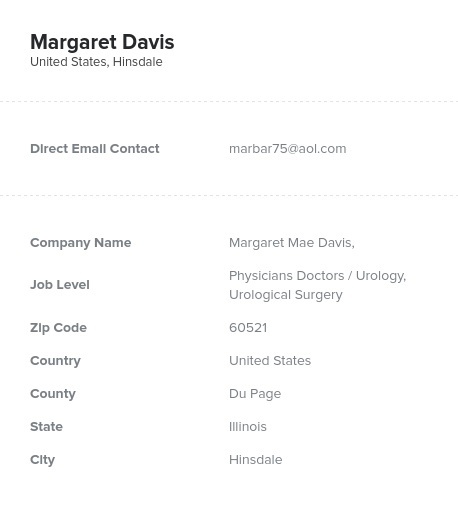 Look up urologists' emails, phone numbers, addresses, and other direct contact information after just a few clicks! Download and integrate our list into your CRM within minutes. Our easy-to-use, downloadable contact list can be used to find specialists working within the specific field of urology and urological surgery at numerous hospitals and institutions. This pre-built, ready-made data product consolidates this spread-out group into one directory. Whether you're marketing a pharmaceutical, a medical product, or a new technology for surgeons, this is the list that contains the relevant medical sales leads that are important to your business. At Bookyourdata.com, we believe that you should be able to market to the people who care about your product the most. Use our urologist email list to market to the doctors who know and can recommend your product for better urinary health today. Urologists work with the urinary systems in both men and women, including the ureters, bladder, and urethra, and the male reproductive system, including the vas deferens, prostate, and testes. Urological surgeons tend to use minimally invasive techniques to heal common disorders. Disorders that urologists treat include everything from urinary tract infections to kidney stones. Many of these disorders are both common and treatable, but others, such as prostate cancer, can be deadly. Make sure this hardworking group of doctors has the tools they need to help their patients by reaching out of them in an effective B2B marketing campaign using this mailing list. Email leads, connect with urologists over the phone, or send mass mailings to let them know about your pharmaceutical or medical device. Inform highly qualified doctors know about your company, its products, and its services by pulling their accurate information from this list. Buy this list of urologists; it's ready for you to download now!